Malaysia is home to some of the world’s grandest Hindu temples; colourful, ornate and forever embedded in the country’s history. These temples are places of intense colour, where aromatic incenses and rhythmic prayer enrich the air. Temples both rustic and urban are the thriving heart of Malaysian communities, where devout locals and adventuring tourists come to worship and meditate. Here are three of the most famous, unique and visually stunning Hindu temples across Malaysia. The Lord Murugan Statue stands a massive 42 metres high and honours Lord Murugan, the most celebrated Hindu deity. 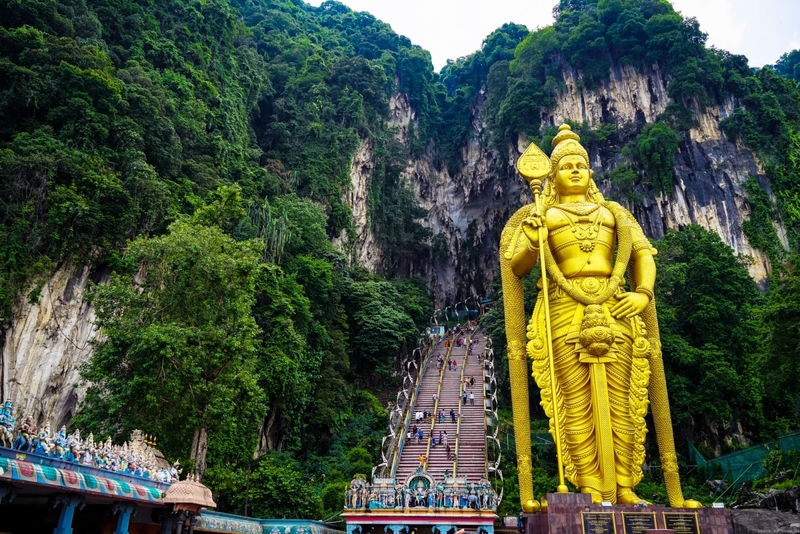 This golden statue is located at the Sri Murugan Perumal Kovil at the foot of the Batu Caves, a catacomb of limestone caverns of particular spiritual significance to Hindus. Popular is the Thaipusam festival, dedicated to when Lord Murugan received the Vel (spear) used to vanquish the evil demon Soorapadman, a perennial event in Hinduism. The temple attracts over one million devotees a year and is well worth a visit. The only glass temple in Malaysia, the Tebaru Glass Temple’s architecture is truly unique. The temple’s exterior towers high with religious iconography and stands iconic. Inside, baroque glass walls embedded with over 300,000 mukhi rudraksha beads and colourful mirrors are a spectacle like no other. The temple is noted for its world class architecture which sparkles like a diamond and is designed to attract devotees from great distances and visitors from around the world. Ceremonies, admired by tourists, take place throughout the day. This more isolated Hindu temple, 30 minutes from Maran town, affords uninterrupted peace and quiet. The Maran Murugan Temple is a pearl coloured stone temple built around a sacred rudraksha tree and is a site of worship to Hindus in Kuala Lumpur and Kuantan. The inner sanctum has a beautiful silver layering that resembles the original rudraksha tree. The temple is most active in March to April during the Panguni Uthiram, when followers pledge requests by tying yellow cloth around the remains of the sacred tree.